but it’s important not to confuse the two. Group that renovates properties in the Cape. 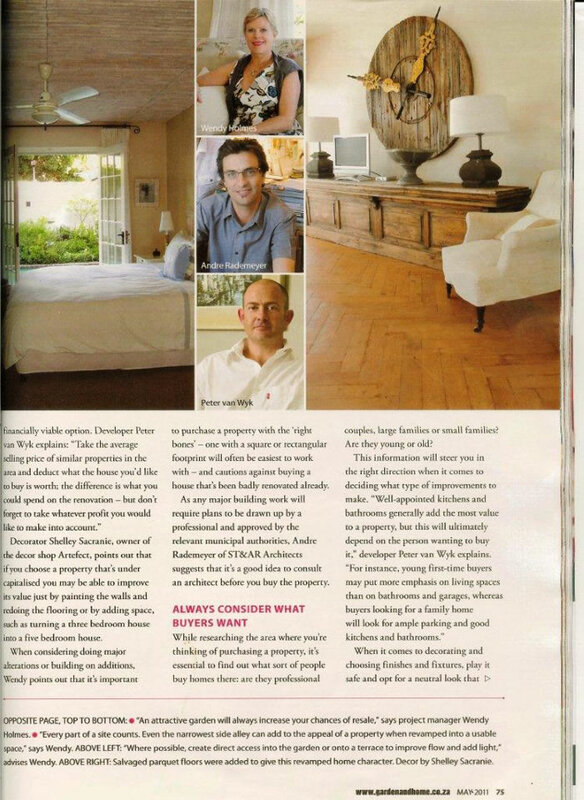 whether a renovation is a financially viable option. bedroom house into a five bedroom house. house that’s been badly renovated already. consult an architect before you buy the property. professional couples, large families or small families? Are they your or old? different to everyone else’s,” says Peter. replace the worktops and vanities. – The rule of thumb is to spend 7 – 14 percent of the estimated market value of the renovated house on the new kitchen, especially on items like the work surfaces, units and appliances. – Today open-plan kitchens sell houses; it may be worth the extra expense and building work required to create one. A less expensive, practical kitchen will sell better than an over-priced poorly-designed space. Choose a “safe” colour scheme to appeal to as many buyers as possible. Create a scullery / laundry additions; here you can use cheaper, yet hard-wearing materials helping to bring the total cost of the kitchen renovation down. Tiles are still the best priced option to use both on the floor and the wall behind the hob. It’s not necessary to tile all the kitchen walls; washable paint works just as well. 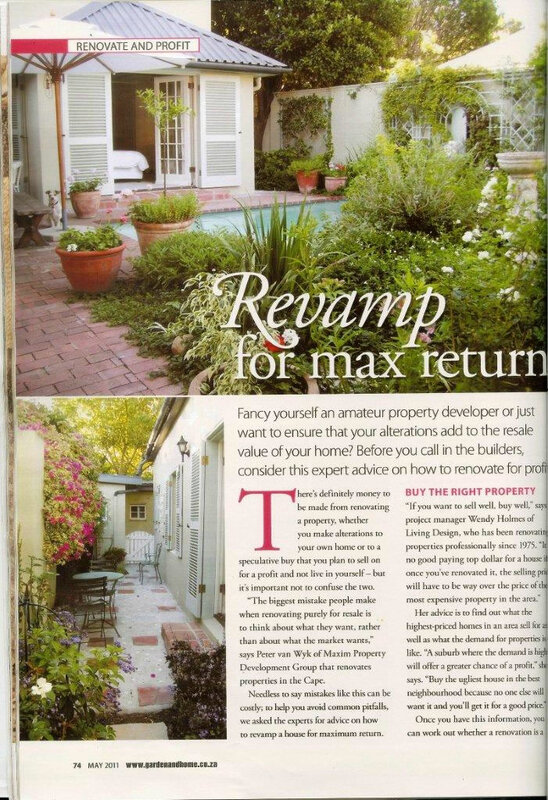 “An attractive garden will always increase your chances of resale,” says project manager Wendy Holmes. “Every part of a site counts. Even the narrowest side alley can add to the appeal of a property when revamped into a usable space,” says Wendy. “Where possible, create direct access into the garden or onto a terrace to improve flow and add light,” advises Wendy. 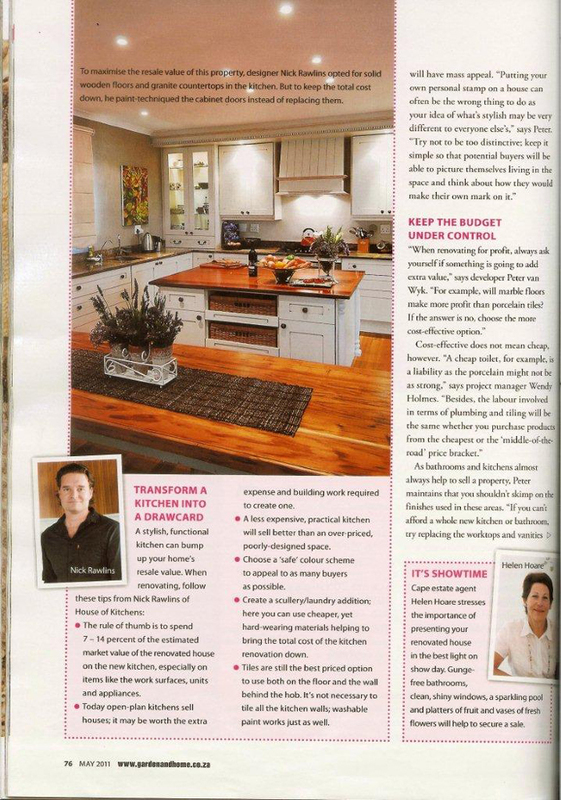 Cape estate agent Helen Hoare stresses the importance of presenting your renovated house in the best light on show day. Gunge-free bathrooms, clean, shiny windows, a sparkling pool and platters of fruit and vases of fresh flowers will help to secure a sale. Living Design – New Homes. Project Management. House Renovation Specialists. Interior and Exterior Renovations and Remodelling. Home Makeovers. Cape Town. House Renovations, Bathroom Renovations, Bedroom Renovations, Patio Renovations, Office Renovations.